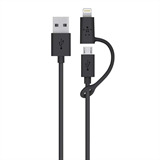 Micro-USB Cable with Lightning connector Adapter is rated 2.5 out of 5 by 11. Rated 1 out of 5 by Harp5123 from Breaks quickly, very flakey I bought this a year or two ago and it broke within a month of use. 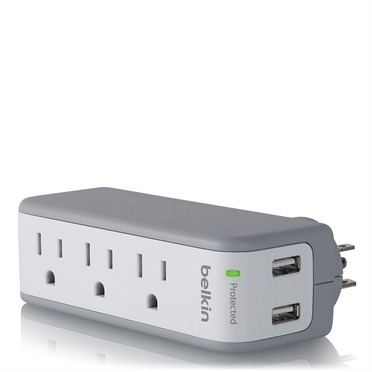 Other belkin products are worthwhile, but this one wears out really quickly. At first it worked well but it quickly began to be difficult to charge anything with. 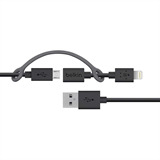 Don’t cut corners, just get two separate cables. Rated 2 out of 5 by Aegarnian from Breaks down easily I bought this three months ago and it is starting to fail. This is the second cable I have bought, and I bought it because the first one stopped working. Now I have to place my iPhone on an angle in order for the cable to charge my phone. The previous cable experienced this same problem and after a while stopped working. Rated 5 out of 5 by Juanpc from Are people crazy? I tested 3Ox China/ACME brand cables... None lasted more than a month... Cable needs big AWG for power lines, and a very robust/solid lightning connector PCB or it will get damaged with a true 2.4 Amps charger or a fall. 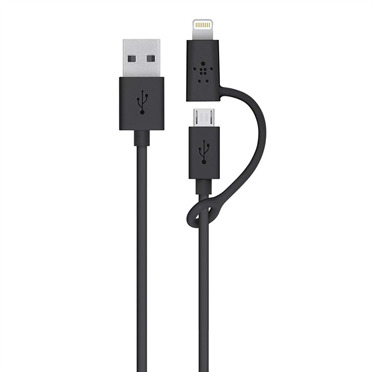 Original Apple Lightning cable lasted 1 year, because I manipulated the iPad4 while it was connected all the time... cable finally broke. I have 2x Belkin, so far so good. 6 months, I try to be more careful now. Sometimes needs to unplug and plug again to the iPad, but always works. could it be iPad internal connector is dirty, or wear. Rated 5 out of 5 by Vince from Terrific idea and versatile I've bought a few of these and think they are terrific. I have one in each of my homes and in my car. The allow me to charge multiple items like the Mophie for my iPhone 6, my iPhone when I'm not using the Mophie and my Kindle. Rated 1 out of 5 by ClydeP from Doesnt work on a 5s I bought this in an airport store because I had left my charger for my Android devices at home and because I needed one for my work iPhone 5S. I got to my destination and it worked fine charging my Kindle Fire with the mini USB. I went to charge my iPhone and the phone shows it charges for 1 second then beeps and quits charging. 2 seconds later, it tries to charge, beeps and turns off. In 5 minutes of trying, it went from 48% charge to 46% charge on my iPhone. I figured maybe it is the transformer that is not working right. It is not an Apple but some Walmart knock off that doesn't work all that well anyway. I plugged my iPhoone in to my PC USB port. NOTHING. computer doesn't see the phone, phone doesn't see PC. Tried several ports on the PC. NOTE: I did not buy this at Walmart but at a store in the C Concourse in Salt Lake City Airport. Does NOT work as advertised. $30 down the drain! Rated 1 out of 5 by mcquca from Total Dud I bought this cable less than a month ago, and it's already crapped out. Will not charge/connect to my computer at all.